In 1894 Laura, husband Almanzo, and their young daughter Rose left De Smet, SD, to find a new home. A friend had given Laura an apple grown near Mansfield, MO, which Laura found to be especially sweet. The family traveled by covered wagon to Mansfield and purchased 40 acres (later quadrupled) for a dairy, fruit, and poultry farm. They named their property Rocky Ridge Farm. Last September my older sister and I visited Mansfield. 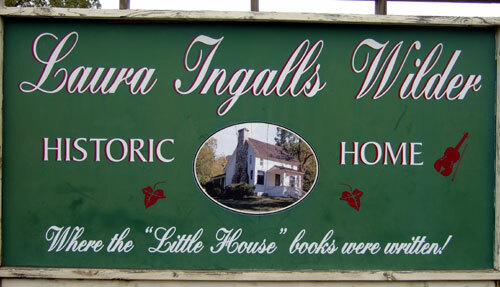 I was curious to see the place where Laura had written some of the Little House books, but since this site didn’t appear in the series, I didn’t expect to connect on an emotional level. I did. 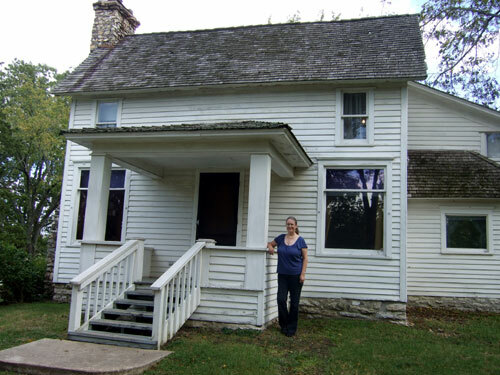 It was touching to take the tour, imagining Laura cooking in the kitchen, tending Almanzo though his final illness in the bedroom, writing at her desk. Certainly this came partly because of the affection I feel toward Laura—both the author and the main character. 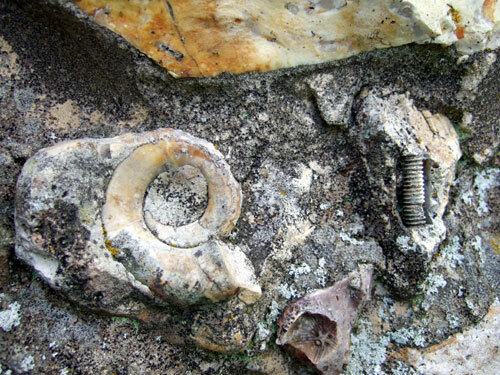 He included fossils when he built the chimney. Almanzo built the home with her comfort in mind—positioning kitchen counters to suit her height, for example. The home looks as if Laura just stepped out. Photos weren’t permitted inside the home proper. This is a covered porch off the kitchen. Upon reflection, though, I realized there was more to it. As a child, Laura lived an almost nomadic existence. Readers journey with Laura as her family moves…moves…moves again. The constant upheaval makes for fascinating reading. The Ingalls’ restlessness, and the adversities they encounter, make Laura an easy person to care about. So it was unexpectedly comforting to see tangible proof that after so many childhood challenges, Laura had a beloved and stable home. Laura and Almanzo lived in this simple farmhouse for over sixty years. In 1928, daughter Rose—a successful writer in her own right—gifted a new house to Laura and Almanzo. She evidently hoped to provide more modern conveniences for her aging parents. 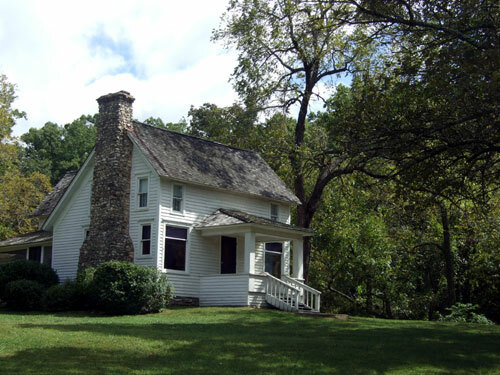 Laura and Almanzo lived in their new home while Rose lived at Rocky Ridge Farm. But when Rose moved to New York in 1936, Laura and Almanzo moved back to Rocky Ridge. Almanzo died at home in 1949; Laura, in 1957. The house Rose provided for her parents was close to Rocky Ridge Farm, but evidently never felt like home. Laura Ingalls Wilder helped spark my lifelong fascination with history. I’m grateful for that. As a writer myself, I’m in awe of her ability to capture the imagination of so many readers, in so many places, for so many years. This entry was posted on March 29, 2012 at 9:09 pm and is filed under AUTHORS. You can follow any responses to this entry through the RSS 2.0 feed. You can leave a response, or trackback from your own site. Your blog is a testimony to the power of fiction in influencing our lives. Stories and story tellers are critical to our cultural heritage. Stories really are fundamental, aren’t they? Thanks, Pam. Sweet thoughts about Laura and you. I only came to know her through the TV series and my daughter’s reading of the books. Generation gap there! The books I grew up with are the editions that Garth Williams illustrated…so charming. I had to get used to the actors in the TV roles, after associating so strongly with the illustrations! I love reading her books as a child, and I too, have visited many of her places. My grandmother was born just south of La Crosse near the same year Laura was born at Pepin, just north of La Crosse, WI. I loved thinking of how closely their lives intersected, even though they never met. That would be fun to think about! And how special to read the books and know how close your grandmother was in time and place. Thanks for sharing! I’ve always wanted to visit Missouri! I did a report on it for 5th grade. And I’ve always LOVED Laura Ingalls Wilder! I’ve been to her home in South Dakota. Thanks for sharing! She was the one who got me interested in history as well. I wonder how many people in our general age bracket who ended up doing sites work got started back with the Little House books? I’m looking forward to visiting South Dakota one day. I’m envious. I’ve only ever visited De Smet, and it was wonderful. I may be making a cross-country road trip in a couple of years, and I think you just added more stops on my itinerary. Laura was a large and cherished part of my childhood. De Smet is still on my list! I’m not going to make it this year, but next summer for sure. I had the books read to me as a young child. I purchased the set as an adult, age 50 in order to read them again. That was ten years ago. I read all of the series. I loved the Town Books, and the Big Winter. Those led to biographies and volumes about the locations that the family lived in. What a wonderful series about the American West. There is so much detail in the everyday lives of her family. I too plan a wide swing through the Mid-Plain states inorder to see her homes. I want to start at Rocky Ridge. 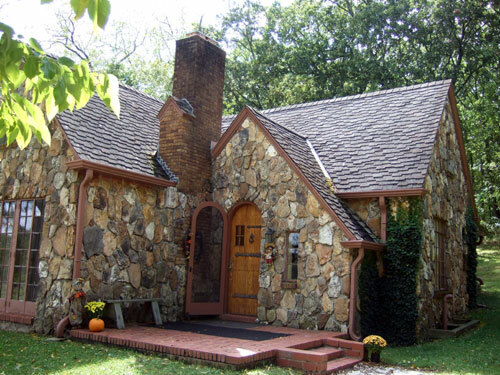 We have property in NW Arkansas and I can use that as a base for travels. Someday I hope to see the De Smet township, the Black Hills, Deadwood and the Little Big Horn. Thanks for sharing your thoughts! I somehow ended up with the original series of LIW hardbacks that my sisters and I shared, and I treasure them. I’m sure you’ll enjoy your travels! I’ve never visited Arkansas, and that’s on my “someday” list. I’m glad you had a nice visit. 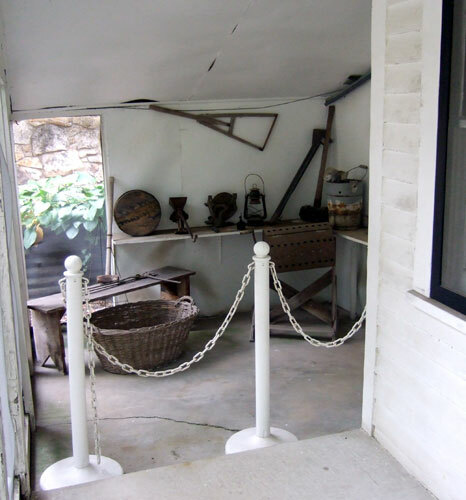 When we went I loved learning all about the houses and the history of the Ingalls family. My favorite was seeing Pa’s violin and seeing the desk Laura wrote some of her wonderful books at.